The rise of jellyfish populations in many of the world's oceans may be more than just an inconvenience for swimmers who want to take a dip. An expert warns it could be a sign of deteriorating marine health. 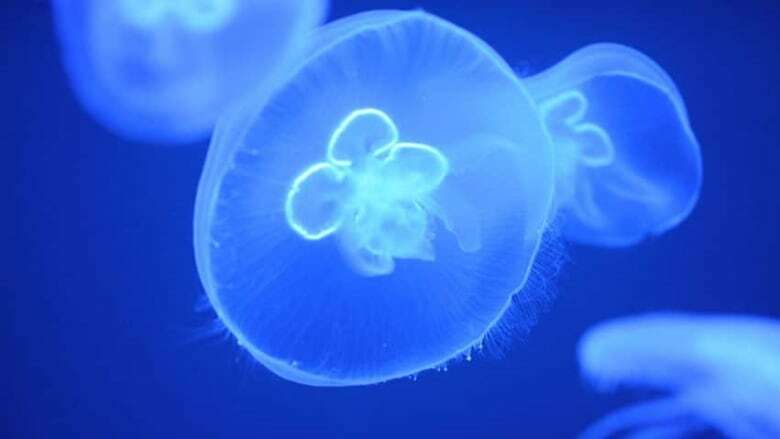 Jellyfish expert Lisa-ann Gershwin predicts that the world's oceans may one day be dominated by the gelatinous sea creatures, similar to the Precambrian era. The rise of jellyfish populations in many of the world's oceans may be more than just an inconvenience for swimmers who want to take a dip. The rapid growth over the last few decades of these creatures is a sign of the planet's deteriorating marine health, according to expert Lisa-ann Gershwin. In her new book Stung! On Jellyfish Blooms and the Future of the Ocean, Gershwin says that these "enchanting and lovely" invertebrates are in fact indicators of the health of the oceans. "They're an indicator that something is out of balance," she told Bob McDonald, host of CBC Radio's Quirks & Quarks. "So they’re kind of the canaries in the coal mine, if you will. Except whereas a canary dies when something’s wrong, jellyfish flourish when something’s wrong." Overfishing, rising water temperatures and ocean acidification create ideal environments for these sea creatures to thrive and multiply, Gershwin explains. "They need something a little bit funky to set them into a cascade of events where they end up in control," said Gershwin. Unfortunately, the rise in jellyfish numbers is far from benign. Gershwin said that jellyfish are able to "take this damaged ecosystem and actually drive it to a much worst state." Although jellyfish rank low on the evolutionary tree (they don't even have brains), they have the unique trait of eating things higher up on the food chain than themselves – things that are bigger, faster and smarter than they are. They also compete with whales by preying on the fish and plankton that these much larger mammals typically feed on. "So jellyfish can wipe out a whole food chain by eating down at the bottom," Gershwin says. "And they’re doing this." As an example, she points to a species of jellyfish called Mnemiopsis leidyi that was accidentally introduced into the Black Sea in the early 1980s. "Within just a few years, it had taken over so completely with this double whammy of predation and competition that Mnemiopsis was now 95 per cent of the biomass in the Black Sea," Gershwin said. "Ninety-five per cent of every living thing was this one species of jellyfish." Gershwin said she fears that the biodiversity of the world's water will eventually resemble that of the Precambrian era, when oceans were ruled by jellyfish and mammals and reptiles did not exist. "I think it’s a very scary thing that we could be heading back to a situation where jellyfish are dominating the oceans," Gershwin says, "but if we keep heading down the path that we’re currently on, I’m not sure I see very many alternatives."